Share the post "Antiques – Blue John, Eye Candy to Antique Collectors"
Blue John Stone is found nowhere in the world but amongst the rocks of Treak Cliff Hill, Castleton and exists in only two caverns: Treak Cliff Cavern and Blue John Cavern. This mineral, a colour banded form of fluorspar, has been prized for many hundreds of years. Vases found amongst the ruins of Pompeii are thought to be made from Blue John stone. 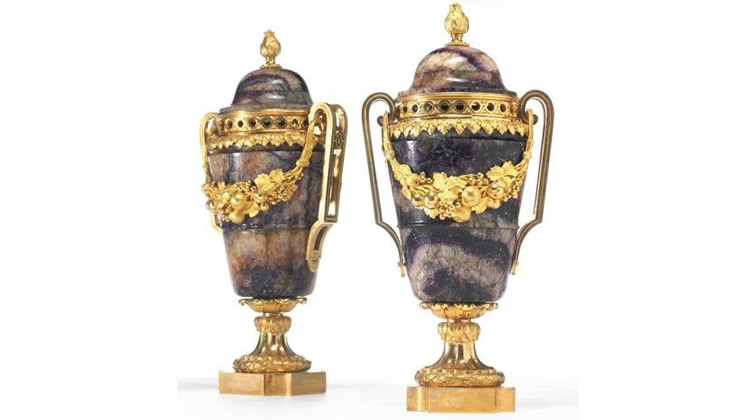 The mineral was much in demand in the 18th century for ornamental vases and columns in some of the finest houses in Britain, most notably Chatsworth, home of the Duchess of Devonshire. The most substantial veins were worked out so that larger pieces are no longer made. The origin of the name ‘Blue John’ is thought to have come from the French ‘bleu et jaune’, meaning ‘blue and yellow’. Treak Cliff Cavern is one of only two working Blue John Stone mines in the world and extracts approximately 0.25 tons per year. The stone is now used for small decorative objects and jewellery, and can be purchased from jewellers and craft shops in Castleton and selected other outlets around the Peak District. Blue John is the rarest natural formation in the British Isles and the only known deposit is found near Castleton in Derbyshire. This mineral only occurs in small masses lining ancient caves or in voids in the limestone and boulder bed of Treak Cliff. Each piece of Blue John has to be extracted carefully by hand as blasting with explosives would open the cleavages effectively shattering the semi-precious stone and rendering it useless. Instead, the usual mining practice is to extract the limestone around the Blue John and so release the latter from its enclosing rock. Hello, I’m in the trade. A client of mine saw these pieces on your website and want to buy it. Could you please give your dealers price?